Thaipusam is the Hindu celebration of Murugan, the Tamil god of war. The holiday, held each year in the month of Thai (roughly the equivalent of January and February on the Tamil calendar), is observed in several countries, but few, if any, rival the events at Batu Caves in Kuala Lumpur, Malaysia. The caves play host to a soaring 140-foot golden statue of Murugan clutching his trademark vel (three-pronged spear). Each year during Thaipusam, the caves draw upwards of a million tourists and devotees. 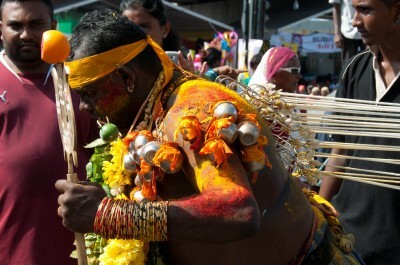 In keeping with its patron deity, Thaipusam is among the more grueling, even gruesome, of Hindu festivals. Endless streams of the faithful take up what Tamils call their kavadi (burden), a physical load representing a spiritual weight of guilt, and present them to Murugan inside the temple at Batu Caves. Some are seeking penance. Others come asking Murugan for favors. Still others flock to the caves to reaffirm their devotion. Much like the intentions of the votaries who tote them, the kavadi takes various forms, from steel pots of milk to wheeled altars dedicated to various Hindu gods. But the focal point of Thaipusam in Kuala Lumpur is the sight of enthusiasts lugging on their shoulders the elaborate mayil kavadi – large, elaborate metal platforms attached to the chest and back of participants with dozens of sharp metal hooks and skewers. The burden carried and the flesh pierced, these are the methods by which devotees attempt to capture Murugan’s attention and thus avail themselves to his boundless stores of wisdom and power. In Hindu lore a man named Idumban was the first to carry a kavadi for the gods. His load has never been rivaled: On a bar placed upon his shoulders, he lugged two giant mountains, an encumbrance only a deity could remove. I first attended Thaipusam last year, for the same purpose as countless others, to see and photograph the procession of mayil kavadi carriers. 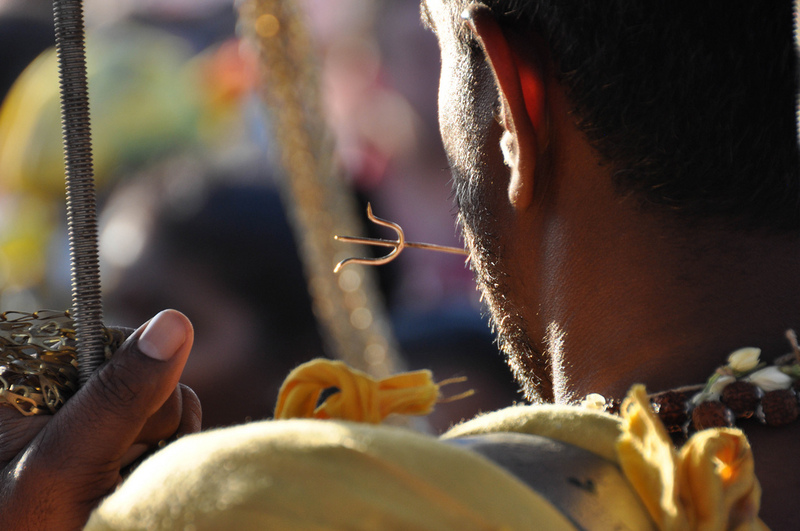 This year I decided to return to learn more about the spiritual significance of Thaipusam. I had spent two months trying to track down anyone who had participated and would be willing to speak with me. Although the event is public, there is still some secrecy regarding rituals. When I happened upon a webpage, kavadimy.com, a one-stop-shop for kavadi-related supplies and information about Thaispusam, I sent an email to the site administrator. Ganesh Mahendran responded quickly. Ten days later, on the morning before this year’s Thaipusam was set to kick off, we met in the parking lot of a restaurant next to the Taman Jaya rail station in Kuala Lumpur. Ganesh, 37, is a second generation Malaysian of South Indian decent. He has a background in engineering and business development. When I asked him how he squared his professional background with his interest in the bizarre supernatural rituals surrounding Thaipusam, he said only that I had to meet a man called “Uncle” and before I knew it we were in Ganesh’s silver car, steering for Uncle’s house in the Kuala Lumpur suburb of Puchong. Uncle, actual name Nadraja Ganesha, was Ganesh’s spiritual advisor and guru. Ganesh called their first meeting the “turning point of his life.” As a teenager, Ganesh had carried to the temple at Batu Caves the paal kavadi (two brass milk pots carried at each end of a pole over one’s shoulders), but as he grew older he became a skeptic. He kept a Hindu shrine in his home but rarely prayed. 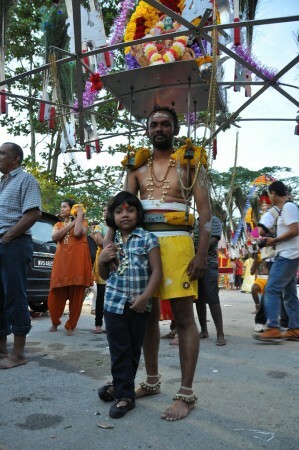 Eventually he attended Thaipusam as little more than a tourist. But Sungeerlla, Ganesh’s financée, persisted. She urged him to take his faith more seriously. She wanted him to take up the mayil kavadi. As he swerved to avoid potholes, Ganesh told me that he had set up his website for the express purpose of driving business to Uncle. A priest in the Amman sect of Hinduism, Uncle had played an integral role in Ganesh’s initiation into all-things kavadi. Introduced to the holy man by a friend, Ganesh had first recoiled at the thought of being pierced with hooks during Thaipusam. “You’re not there to put on a show,” Uncle told him. “You’re there to do penance, to offer yourself to god.” Ganesh acquiesced. He first laid his burden at Murugan’s feet in 2010. Shortly thereafter, he and Sungeerlla were wed. The driveway betrayed which house was Uncle’s. There in the concrete driveway out front was a Hindu temple, 10 x 10, 15 feet tall. The shrine’s main structure was square, the roof triangular. Statues of females holding knives flanked the lower half. The triangular roof was covered in statues of lions, gods holding swords, and creatures resembling dragons. In a recess in the temple front stood a statue of Nageswari Amman, the Tamil mother goddess. To her side was a statue of Kali, the goddess of destruction, one of her four hands wielding a saber, another gripping a severed human head. Uncle met us at the door. “Vanakam,” he greeted us in Tamil and motioned inside. He was a half foot south of six feet tall, short and yet solid, and, for a 65 year old, his mustache and hair, a thick sable shock brushed neatly back, were remarkably ungrizzled. Inside the house, there were boxes of peacock feathers, piles of unassembled mayil kavadi, flowers, and, on the whitewashed cement walls, drawings of Shiva, Ganesh, and Amman. It was obvious that Uncle was in the thick of Thaispusam prep. Sitting on the tile floor sipping coffee among the boxes, Uncle explained the significance of Thaipusam and his move from being a building contractor to a priest for Amman, a goddess known for her powers over disease and fertility. He said he had no regrets. Assisting others in their spiritual journey brought him satisfaction. His previous experience in construction continued to pay off. He had personally overseen the building of the driveway temple and, with help from his sons, erected countless mayil kavadi with his own hands. After a few minutes, I could understand why Ganesh not only looked up to Uncle but also reveled in his company. Uncle commanded respect; he was also unpresuming. At one point, he retreated upstairs to retrieve a fishing reel ordered from the US. He invited me to go fishing with him once Thaipusam ended. It seemed work and play for Uncle were each a quest for the elusive, whether in the heavens or in the sea. Ganesh dropped me back at the station and I took the train home to Sentul, a northwestern suburb of Kuala Lumpur, to grab a snack and my camera. A few hours later, I drove to Batu Caves to reconnoiter with Ganesh. This year, for the first time in three years, Ganesh was attending Thaipusam without the kavadi. His wife had given birth to a daughter, Rukshna, three weeks before. The birth or death of an immediate family member renders participants ritually unclean and therefore ineligible. Uncle, whose mother had recently died, was also going unburdened. But in a tent up the road he was preparing a group of pilgrims for the heavy march to Murugan’s temple. Ganesh and I parked our cars a mile from the caves. The walk should have taken fifteen minutes. 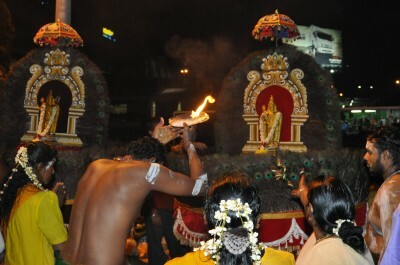 But that night, because of Thaipusam, the crowd had swelled to enormous proportions. The eastbound MRR2 highway was clogged by the procession. The westbound MRR2 was a parking lot. The few vehicles still attended by drivers were idling. Most cars had been abandoned all together. It was 8 p.m. An afterthought of sun guttered on the horizon but the heat still simmered, an invisible blaze. Vendors were hawking nasi lemak (steamed rice, chili paste and dried anchovies wrapped in a banana leaf), nasi goring (fried rice), cooked mixed vegetables, fruit, juice, soda, coconut milk, toys, CDs, head shaves, and used cars. Speakers the size of tractors blared tinny Tamil music. Priests rang bells and beat drums while spectators cheered and blasted off fireworks. Bright lights from altars, vehicles, vendor stalls, and sacred fires flooded the darkness. Ganesh and I pressed through the throngs of people, intent on getting to Uncle and his gaggle of kavadi carriers before the holy tromp began. The pavement was nearly hidden under the carpet of broken coconuts, trash, orange peels, and tufts of hair from freshly shaven scalps. In a parking lot that had been turned into a staging area and starting point for Thaipusam, a myriad of people were getting ready for the pilgrimage. In an open-sided tent, beneath a ceiling fan, surrounded by several pilgrims dressed in yellow, Uncle stood clutching a steel tray. He had swapped his slacks and button-down for a dark orange lungi and white tank top. The tray contained holy ash, a small flame, a betel nut leaf, turmeric, and a red powder called kumkum. Uncle told me he uses these materials to invoke the spirits of Hindu gods into the kavadi carriers. The gods, he said, then take possession of their hosts, imbuing them with the mettle needed to successfully wield the kavadi. 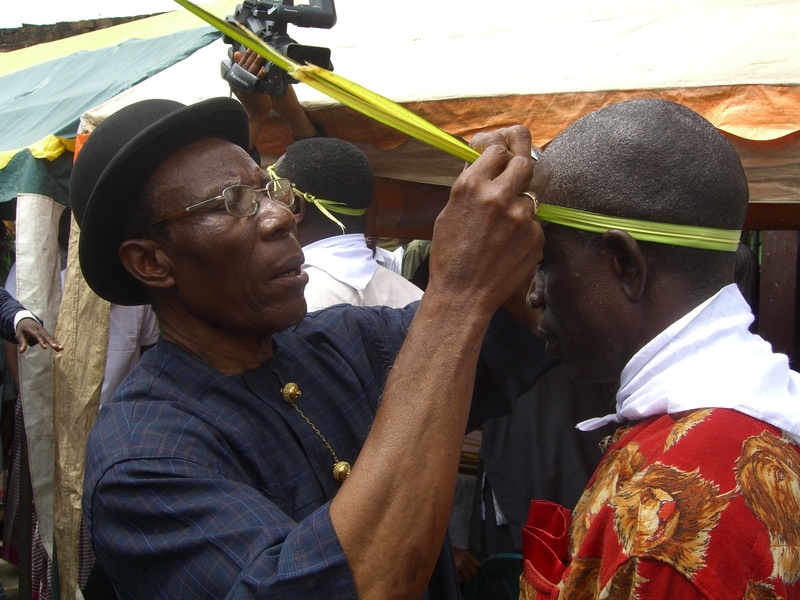 The prayers completed, Uncle recited an incantation (the sacred words of which he made me swear to keep secret), dipped his finger into the steel to collect some ash, then touched his finger to the foreheads of the people in the line. In turn the spirits entered and took control. Mala, a tall, slender, reserved Indonesian woman who currently lives in Saudi Arabia, put her hands together above her head and began hissing like a snake, one of the symbols associated with Nageswari Amman, the main mother goddess in South Indian Hinduism. Ramu, a stocky man known as something of a jokester, grunted and began grabbing for fruit, suddenly inhabited by Hanuman, the ape-like deity from the Hindu epic, Ramayana. While Ramu dawdled there, knees bent monkey-like, Uncle pierced him with 108 hooks then attached flowers and green apples, offerings to Murugan, to each one. Just then Geetha, donning a red sari, the only one not clad in yellow, began to scream and wheel about with slow, deliberate steps. Uncle said Amman had also taken control of Geetha. I asked him how he could tell. He said he always knew. He was the priest. If he knew anything, he knew the gods. Thembirajah, Uncle’s 32-year-old son, was next up. After taking the kavadi onto his shoulders and bolting shut the cloth-covered metal waist strap, he stood balancing the unwieldy object. Thembirajah’s 4-year-old daughter, Lakshikah, took some ash and placed it on her father’s head with her finger. Uncle stepped forward to beckon the spirits to enter. Thembirajah bucked, stomped, and spun like a wild bull while two people tried to restrain him. Lakshikah watched with a concerned yet diffident look. After a few minutes, Thembirajah became very docile, took a seat on a stool, and stared forward with glassy eyes as Uncle and Arasu pierced him in the back and chest with row after row of hooks, 48 in total, all attached to chains suspended from the corners of the hexagram shaped mayil kavadi. Thembirajah then stuck out his tongue and Arusu ran a small metal vel through. The last one to be pierced was Uncle’s second son, 37-year-old Ramesh. His legs bounced up and down as he became possessed. He was sitting on a stool. He pounded the pavement with relentless vigor, as if he were trying to make the ground buckle with his bare feet. Batu Caves, meaning “Stone Caves” in Malay, is located inside sheer limestone cliffs on a small mountain in the Gombak area of northern Kuala Lumpur. The epicenter is the Hindu temple for Murugan, located nearly 350 feet from the base and accessible only by climbing 272 steep steps. The cave was turned into a Hindu temple in 1890 by K. Thamboosamy Pillay, a Singapore-born Indian trader. The temple was dedicated to Murugan because the cave’s entrance resembled the god’s giant vel. Thaipusam has been celebrated at Batu Caves since 1892. With a population of Malay Muslims, Indian Hindus, Chinese Buddhists, Christians, as well as a host of smaller sects, Malaysia prides itself on religious diversity. Although many of non-Hindus in Kuala Lumpur find Thaipusam bewildering and the body mutilation disturbing, the festival gone on unimpeded for 121 years. At long last we began the mile walk from the staging area to the Batu Cave temple. It was 7 a.m. The rekindled sun threw light on the roadway. Preparations had been going on for nearly eleven hours. The crowd of devotees ambled forward, shouting “Vel-Vel,” a devotional chant to Murugan. Halting sporadically, the entranced kavadi carriers danced – spinning, dipping, jumping – like muscular ballet-dancers trying to throw off an attacking creature outfitted in aluminum, feathers, and flashing lights. Onlookers stood on walls and rooftops, sat on guardrails, and clung to streetlight poles. We were squeezed together between guardrails, a million people pressed into two square miles. As we neared the steps, the 140-foot-tall statue of Murugan towered over us. An emaciated Indian man, wearing only a pair of soiled shorts, ushered our group away from the tourists into a line for kavadi carriers. He said not a word. He pointed towards the left side of the stairs and pushed each of us on the back, as if giving us a boost for the ascent. I glanced over at Ramesh and saw the beads of sweat running down his back, the trickling streams hindered only by the hooks. Some two hours since leaving the staging area, we made it to the lip of the cave. At the hilt of the stairs, Geetha, Mala, Ramu, and the rest paused to regain their breath. The cave was huge, the ceiling vaulting hundreds of feet above. Sunlight streamed through holes in the cave here and there, brightening the dim glow of torches, candles, and sporadically hung electric lamps. There were thousands of people inside. They sang, chanted, screamed, and gulped for air. Bells were ringing. The scene was a cross between a beehive and a scene from Indiana Jones and the Temple of Doom. The entrance of the cave descended into a main hall containing several shrines, including the one for Murugan, the sanctum sanctorum of the temple complex. The main cave ended at another flight of steps, which rose to another small shrine almost completely open to the sky. A cool breeze flowed out from deep within the cave. Gopal put his head back as though savoring the respite from the heat. Ramesh and Thembirajah, knowing their journey was coming to an end, began to gyrate and spin in circles. One by one, the carriers entered the bowels of the cave and patiently waited for their mayil kavadi to be removed. Suresh, Uncle’s eldest son, placed a plastic stool on the cave floor so that Thembirajah could sit. Arasu approached Thembirajah, squatted beside him, and began removing the hooks from his chest and back, the vel from his tongue, and the heavy kavadi from his shoulders. Thembirajah and the rest of the group neither flinched nor bled. Incantations followed. More ash was smeared across sweaty foreheads. As quickly as the spirits had been invoked, the spirits appeared to beat a quick retreat, causing their former hosts to collapse in exhaustion. While the pilgrims picked up their belongings to begin the slow walk back to the staging area, Suresh invited me to end the day with the group. They were returning to the staging area to celebrate and break the fast. He urged me to come along, but I excused myself. I was looking forward to a cold shower and a nap. I nudged my weary body to take just one more step towards my still-distant car. I must have resembled a zombie looking for some poor soul to bite. I drove home in silence, replaying over and over the events of the past thirty hours. I wondered when I would next see Uncle. Would it be at his home discussing Hindu rituals, or perhaps reeling in fish somewhere off the coast of Malaysia? Either way, I knew it would likely involve hooks. Aaron Goccia, an EthnoTraveler contributor, lives and writes in Kuala Lumpur.